We have found the best, most simple solution for all of the crayons and markers in our house. We had tried other types of containers for them and they just never seemed to work out. We had them previously in containers with snap on lids but the crayons and markers never seemed to all make it back in there or the lid would never be on right. Then there was the trouble of where to keep the container. 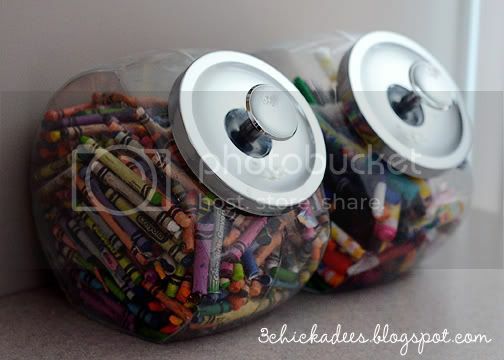 I had seen other people store crayons in glass containers with glass lids but that always made me a little nervous thinking they'd slam the lid and it would break. These glass candy jars with metal lids have been PERFECT. We keep them on the counter and the kids can use them at will to create...and they love to create! The best thing it the crayons and markers always make it back into the container! FYI I have seen these types of containers at Wal-Mart.